Opening in Bennington Museum’s Works on Paper Gallery on May 7 is it is all a mystery, Drawings by Marcy Hermansader, 1981-2015. At first this exhibition may appear to be a group show. But upon closer examination the viewer will see a selective retrospective, featuring four distinct bodies of work by the same artist dating from 1981 through 2015. Upon even closer inspection the distinctive combination of Hermansader’s hand, mind, and eye working together threads the works into a cohesive whole. Hermansader has a knack for inventing new modes of expression for new creative impulses, while always maintaining a distinctive voice. Drawing on a deep well of intuitive, often deeply personal symbols and images, Hermansader’s work is akin to sophisticated visual poetry. “While the works are all paper based, to call them “works on paper” seems insufficient. They are works with paper, drawn on, ripped and pricked, sewn, cut and glued. Each work is simultaneously a fleeting, ephemeral dream image and a highly material, haptic experience for the viewer.” states Jamie Franklin, curator at the Bennington Museum. This exhibition is on view through July 31. It is all a mystery, beginning when something calls to me – perhaps an object as small and specific as a seed, or as large and formless as two faraway wars. Time passes…….sometimes weeks, sometimes years. But it comes back to me – reduced to an essence or built into a web of connections. The seed, or whatever it was, no longer looks like the seed, but maybe it looks like what it was about the seed that was calling to me. I draw and shape paper trying to capture these glimpses and the emotions that are connected to them. The paper is often just a background to work on. But I may cut into it creating flaps or windows or punctures – as if seeking something vital inside or behind it. On the other hand, weaving paper or building up layers has seemed to me like an attempt at repair – the repetition of small marks, an act of meditation. Marcy Hermansader was born in 1951 and has lived in Vermont since 1975. She received a BFA in sculpture from the Philadelphia College of Art where she studied with Cynthia Carlson, Ree Morton, and Rafael Ferrer. She has been given one person shows by Williams College Museum of Art, The Pennsylvania Academy of Art, and the DeCordova Museum, among others. 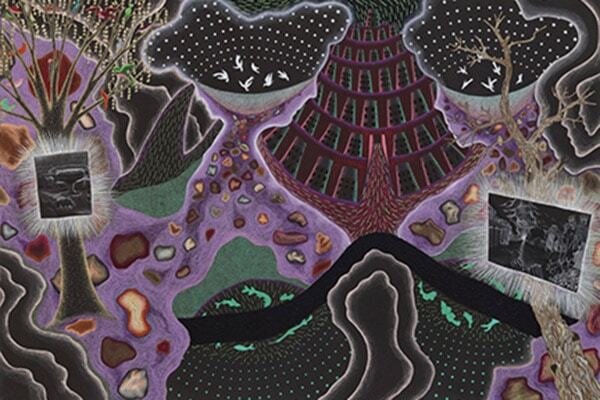 The artist has also participated in over fifty group exhibitions including “Interfaces: Outsider Art and the Mainstream” at the Philadelphia Museum of Art, “The Drawn Page” at the Aldrich Museum of Contemporary Art, and “Curator’s Choice” at the Bronx Museum. She has been recognized by fellowships from the National Endowment for the Arts, the Vermont Arts Council, and the Vermont Community Foundation. Her work is held in numerous public and private collections. BigTown Gallery in Rochester, and Fleisher/Ollman Gallery in Philadelphia represent her work. The artist has also worked with the Vermont Arts Council to help improve access to the arts for people with disabilities.